It’s easy to think that the words ‘Best’ and ‘Beginners’ contradict each other, especially in a world of high tech gadgets and ever-evolving cameras. 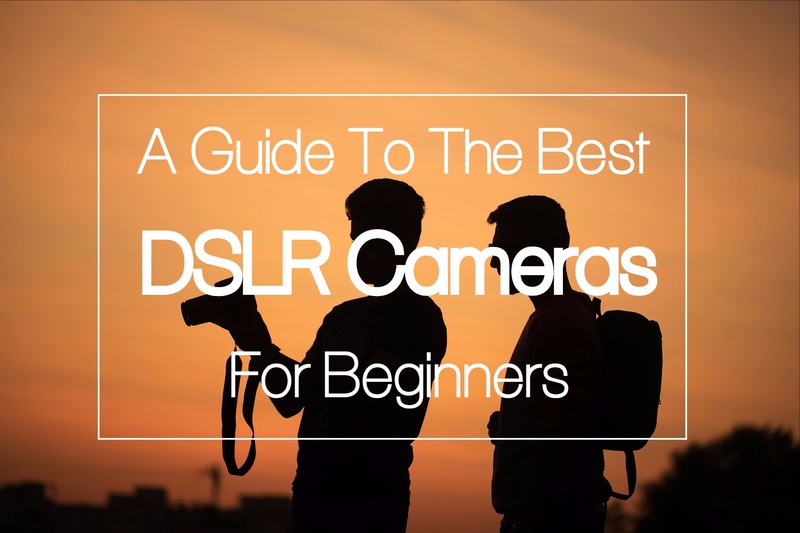 At first glance, DSLR cameras are overwhelming and the terminology is a minefield; however with this guide you’ll learn and build upon the basics, whilst embarking on your journey to becoming a professional photographer! If you’re keen to take the plunge into the DSLR territory you’ll be open to a world of cutting edge technology, immense quality and most of all – more control over the composition of your shots. Being equipped with the right camera body will get you more detail than the average point-and-shoot. In this article we will cover what to consider when buying (or upgrading) your DSLR camera, as well as a list of DSLR camera bodies from our favourite brands. Megapixels: Megapixels (MP) affect the amount of information the sensor is able to process. This is probably the first term you’ll come across for any camera-based product. The more megapixels your camera has the more information it can process – resulting in a more detailed photograph. If your intentions are to post pictures for your leisure on social media then the amount of megapixels shouldn’t be an issue, however if you plan to set up a professional photography website then you want the megapixels at the highest you can afford. Don’t get bogged down if you can’t afford that camera with 40 megapixels – if you’re starting out, a camera with at least 15 megapixels is fine to begin with. Follow this resource for a more detailed guide on sensors in the mean time. ‘Kit’ lens: Kits are a great way to keep costs down especially if you’re just stepping into the world of DSLR cameras. Kits come with a lens when you buy the body of the camera – while most of the kit lenses are lower grade, they’re the best to start out with in order to get used to your new camera. Frames Per Second (FPS): As the name suggests, this is the amount of shots your camera can take in a second. This is especially useful if you aim to pursue wildlife, motor or sports photography as this will ensure faster trigger rates. ISO: This simply means the light sensitivity of your camera – the higher the number it goes up to, the more sensitive to light your camera will be. Be wary of using too high of an ISO in an already well-lit area as this will over-expose your image. But on this note – too low of an ISO will underexpose it. Flip-screen: This isn’t a necessity to capture amazing photos, however it’s great for experimentation and to practice your framing techniques for the likes of portrait or landscape photography. It’s also great if you plan to record videos or vlogs. 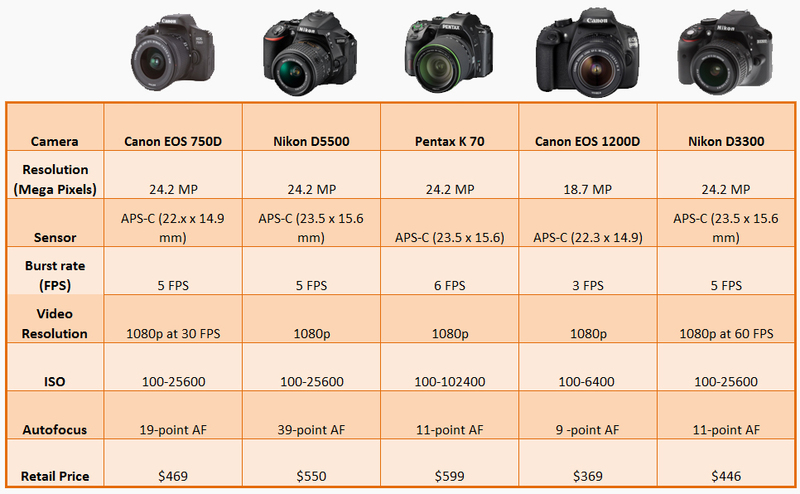 An important question you need to ask yourself – Is a DSLR camera right for me? It allows flexibility: DSLR’s allow you to change lenses at your will. Interchangeable lenses therefore means your camera is open to achieving a variety of shots and effects. For example a telephoto (zoom) lens will allow you to zoom in on subjects whereas as macro lens allows you to take close up detail shots. A DSLR also allows you to create stunning different effects with the use of accessories such as colour filters, flash guns and many more. Be aware of the (few) downsides. Unfortunately DSLRs aren’t cheap to come by, however many places offer second-hand cameras, not to mention you have options of buying a kit to reduce your overall spend. This being said – it’s worth the buck for the amazing photos you’ll capture! The ISO range of this enthusiast – level camera ranges from 100-12800 (expandable up to 25600)and a DIGIC 6 processor which allows this camera to fire up to 5FPS. Although this camera was released in 2015, the 750D has more megapixels than its predecessor – the 700D (24.2 vs. 18) and is able to produce twice as many autofocus points. The Canon EOS 750D also provides a flip-out screen allowing you to make effortless changes on the menu, also making it great for a budding filmmaker! The D5600 is considered an entry to mid-range camera with a small body. It’s a crop sensor camera ideal for a pro-am and is a great choice for a beginner wanting to upgrade or simply to get stuck in on a camera with more advanced features. This intermediate camera has burst rate of 5 FPS coupled with 24.3 megapixels. This camera also boasts a 39-point autofocus and shoots 1080p video – making it an all-rounder for photography and film with yet another swivelling LCD touch screen. The K-70 is an upgrade of the K-S2 – bumping up the megapixels from 20.2 to 24.2. It has built in features that reduce the troublesome ‘moire’ effect, resulting in less noise and improved colour detail with ISO running up to 102400. The biggest asset of the K-70 is its reputation as a weather-resistant DSLR, ranking highly for this purpose in the photography community with its ability to shoot in -10 C temperatures. The most affordable of the lot and a great introduction to the world of Canon and packs a punch for its buck – with 3FPS and 1080p video capture as well as an on screen shooting guide to help you compose your shots. This camera boasts an epic 18MP and ISO beginning at 100-6400 and expanded all the way up to 12800 when fully expanded. This is the best beginner budget camera that’s packed with lots of technical features as well as playful special effects such as the ‘Toy Camera’ and ‘Fish Eye’. The D3300 has been known to give the Canon 750D a run for its money. It’s a really well-priced, versatile camera with a burst rate of 5 FPS and 24MP. It has a fixed 3” LCD making it a great choice for aspiring videographers too, coupled with the ability to record at 1080p video. The best thing about this camera is its more commonly sold in camera shops as a kit – giving you more value for your money. We hope this beginners photography guide was helpful – remember that whether you’re looking for an entry-level DSLR to get started with or an intermediate camera to get stuck in, there will always be an option for every level of photography out there. If you’re still spoiled for choice – we highly recommend renting out cameras and see which ones you feel most comfortable with before you fully invest. When you find the right camera, you’ll know.